With the Spring/Summer movie season nearly upon us, I’m hardly able to contain my enthusiasm for Guardians of the Galaxy. In preparation for what I hope will be most epic Marvel movie yet, I decided to explore the Guardians’ origins and read the series. The whole damn thing. Lawd help me. The team that Marvel is launching into the public consciousness with this Summer’s ultra-mega-super blockbuster (because that’s what it will be if I have to buy all the damn tickets myself, goddamnit) is not the first super team to bear that title. The original Guardians go all the way back to 1969 and were among the first of the cosmic hero teams, even Jack Kirby’s classic New Gods by a few years. This early incarnation of the Guardians was set a thousand years in the Earth’s future in an alternate timeline, and featured post-human heroes who were engineered to survive on different worlds of the solar system, and who were the last of their respective kinds. That’s right–in the future of the Marvel universe, the last nebulous representatives of the human race fly through space and punch evil. I wouldn’t want it any other way. Lead by Captain Vance Astrovik, a powerful, thousand-year-old psychic who just happens to be the last Earthman and current wielder of another Captain’s famous shield, and gender-bending anti-hero Starhawk, these Guardians are definitely heroes for the disco era. Frankly, I considered the 70 or so issues of the original Guardians something of a slog from the outset, but I persevered because I wanted to understand the legacy of the Guardians and how it connects to the more modern incarnation. Being an Iron Age fan, I sometimes struggle with the camp factor of Silver and Golden age stories, but the early Guardians have a sense of adventure, and are so different from other Marvel titles of the day, that they’re really hard to resist. But of course, what I really wanted to get into are the 2008 and later Guardians titles–the Star-Lord Guardians. Now, I know Star-Lord has his origins in the 70’s, but unfortunately, I haven’t been able to find any of those early stories. Instead, I started in with the Annihilation: Conquest event, and then proceeded through Marvel’s cosmic sagas of the early 2000’s–titles that I had largely overlooked during a decidedly Vertigo-focused time of my comic reading life. What I discovered is some of the best writing in my comic reading career. Largely penned by Dan Abnett, who is most well known for his contributions to Warhammer 40k’s fictional universe, Abnett also over saw the story arcs contributed to by other authors supporting the Annihilation arc and it’s follow-ups, creating a cohesive and extremely wry vision of the Marvel cosmic universe. 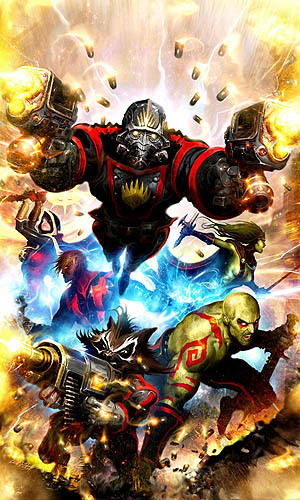 At the conclusion of Annihilation, Abnett took the reigns of the Guardians and has written the title since. Abnett’s style–tight action scenes, clever plotting, and punctuated with dark humor–make for a gripping read, but also translate well to the big screen. I think it’s clear from the recent trailer, that the honchos at the MCU are making efforts to honor that tone. That said, as near as I can tell, they’ve engineered an entirely new story for the film, so time will tell if they’ve come up with something as clever as Abnett has managed in his run. After having spent the better part of the month drowning in the cosmic end of Marvel’s olympic sized swimming pool of ideas, I’m looking forward to seeing some of those great ideas come to life on the big screen, regardless.